← Harrison Ford? In “Anchor Man 2”? Seriously? 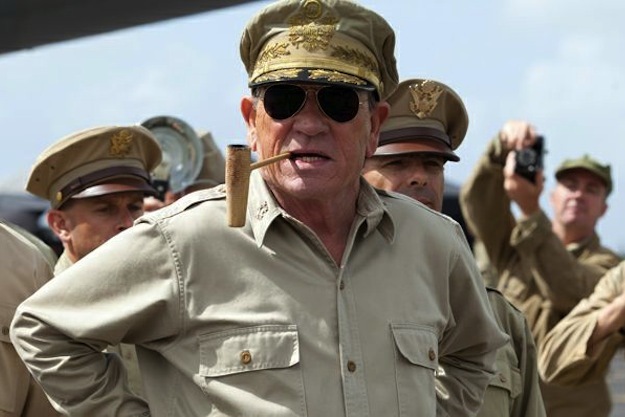 And if you’re going to portray the World War II general nicknamed “American Caesar” by some historians, in the movie “Emperor,” that’s a liberating thing. Most people not remember or even know “who the man was, Americans being ignorant of their own history,” Jones says. And it’s been difficult even for historians to get under the skin of the “real” General of the Army, victor in the Pacific, head of the occupation of Japan and the man who conceived the daring Inchon landings that turned the tide in the Korean War. The MacArthur that Jones delivers in “Emperor” is off the cuff, cagey and salty – a career soldier who swears and imperiously sets his own foreign policy, brushing off Washington, working out whether or not to prosecute Emperor Hirohito for war crimes. In the film he gives the job to a trusted aide, General Bonner Fellers (Matthew Fox), a real historical figure with a Hollywood-invented romantic past with a Japanese woman. “It’s a love story, East meeting West told in personal terms, with all this history as a backdrop,” Jones explains. “This stupid label — ‘Western’ — it’s hard to get around that,” he grouses. “There are a lot of people, who, once they teach themselves to pronounce that word ‘Western,’ think they understand the movies.” A master of that film idiom, with “Lonesome Dove,” “The Missing,” “The Three Burials of Melquiades Estrada” and “The Good Old Boys” under his hat, Jones objects to the way the label “Western” limits the story, both for possible film financiers and for moviegoers. He’s got enough to fret over, co-writing and directing the film, without labels. “The undependability of the weather is the biggest thing you deal with when you film something like this,” he says. “We want to snow on the day we need it to snow. And that’s not going to happen. Whoever’s in control of the weather doesn’t pay much attention to me and my requests about that. We have all these period sets to build, pretty far apart, in Northeastern New Mexico.